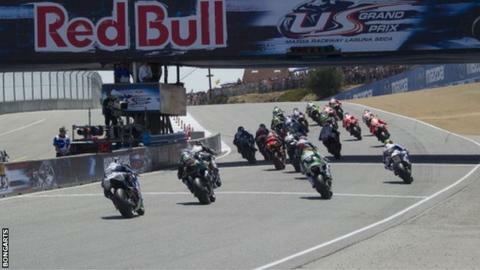 Two Spanish riders have died after a multi-bike crash at a World Superbike support event in California on Sunday. The crash happened on lap one of the MotoAmerica Superbike/Superstock 1000 race at Mazda Raceway in Laguna Seca. Bernat Martinez, 35, went by ambulance to hospital in Monterey while Daniel Rivas Fernandez, 27, was flown to Salinas. Both died from their injuries. MotoAmerica president Wayne Rainey sent his "sincere condolences" to their families and the "MotoAmerica family".